Why do we use DocBook format? What Versions of DocBook are Used? DocBook is an SGML or XML based markup language designed for producing books and technical articles. (In SGML or XML terminology, DocBook is a DTD.) You can find out more about DocBook here or here. We use DocBook to isolate data maintenance from document formatting. If I had to support all kinds of document formats within the Do178Builder program itself, I'd never even have attempted to write the program in the first place. Why reinvent the wheel? PDF or HTML for online viewing. RTF, for importing into Microsoft Word or other word-processing programs. ... and others, such as ISO standard ODF (for OpenOffice.org and other programs) or Word OOXML (docx), depending on what DocBook conversion software is available to you. Furthermore, you have a lot more control over the exact format of these conversions than you would have if Do178Builder directly printed your documents. Each of the conversions is based on a "stylesheet," and by changing the stylesheet you can change the output appearance. Personally, I'd advise you to publish directly to PDF, and avoid the temptation to convert the stuff into Microsoft Word for manual reformatting. It's the kind of thing that seems easier in the short term, but eats enormous amounts of time in the long run. Of course, you're free to do as you like. Beginning with Do178Builder's 20080127 development snapshot, optional support for DocBook XML v4.x has been added. The reason for this is that while DocBook v3.1 remains available, and it remains perfectly feasible and simple for Linux users such as myself to continue using that version, on more primitive platforms such as Microsoft Windows it is somewhat more problematic to do so. Tools on that platform tend to want to support only XML, and only DocBook v4.x. Consequently, I've chosen to add some extra support for those poor, sad Windows users. After all, they have a hard enough time of it already, without my adding to their woes. And, in the intervening years, the full documentation for DocBook v4.x has become available (at the link listed above), so that's no longer a reason to avoid DocBook 4.x. By default , v3.1 SGML is still used. If you start Do178Builder with one of the command-line switches "--x412", "--x42", "--x43", "--x44", or "--x45", then v4.x XML will be used instead. This is explained in more detail on the tutorial page, where the command-line switches are described in detail. Since DocBook 3.1 is not precisely compatible with DocBook 4.x, and since DocBook SGML is not exactly compatible with DocBook XML, some philosophical choices have had to be made regarding the exact style of DocBook markup that Do178Builder uses to implement various effects. Wherever possible, of course, compatible markup is used. Where compatible markup is not possible, Do178Builder always chooses to use DocBook 3.1 SGML markup internally; however, it converts the markup as necessary to DocBook 4.x XML when output files are created, so it's not something you normally have to worry about unless you manually add your own markup for DocBook commands that Do178Builder doesn't directly support. In that case, you may get markup that will work for you, but that Do178Builder cannot automatically convert if a different version of DocBook is selected later. The default appearances of documents converted from the DocBook SGML/XML into PDF or other printable forms are very good, in my view, and could easily be used without change. But you may want a little more control, perhaps to conform to your company's standard for document formats. Perhaps you need different page headers, or different fonts, or a watermark. In that case, you can tweak the default stylesheets to get exactly the appearances you like. And of course, you only have to tweak the stylesheets once, rather than for every document set. The stylesheets provided with the usual Linux-based DocBook converter programs are written in a language called DSSSL (Document Style Semantics and Specification Language). The same stylesheets seem to work both the DocBook SGML 3.1 and DocBook XML 4.x. I should also mention that some DocBook converter programs may use stylesheets that are written in XSL (eXtensible Style Language). XSL stylesheets are much more complex than DSSSL stylesheets, and my understanding of them is more limited, so I can't really explain here how to customize them. With that said, however, in the source tree for the Do178Builder program that you get when downloading the development snapshot there is an XSL stylesheet called Do178Builder.xsl that can be used to publish documents not unlike those that you can get using the DSSSL stylesheets, and another XSL stylesheet called MyCustomization.xsl that you might be able to use as a starting point for making some of your own customizations. I say "not unlike" rather than "the same", because I haven't figured out how to fully modify them to get exactly identical results to the DSSSL stylesheets. But they're close enough for government work. The README file in the development-snapshot source tree describes how to use them with the XMLmind converter program (see below). So I'll discuss only the DSSSL stylesheets here. The default DSSSL stylesheets are pretty complex, and it is apparently best to limit your changes (when you can) to changing a few default values. This is explained in section 4.4 of the first edition of DocBook: The Definitive Guide, which the authors (Walsh & Muellner) and the publisher (O'Reilly) have graciously made available online. SuSE Linux PPC, v7.1: /usr/share/sgml/docbook-toys/suse-both.dsl. SuSE Linux PPC, v7.3: /usr/share/sgml/docbook/docbook-toys/suse-both.dsl. Many of the major Linux distributions contain (for free) all of the tools you need for converting the DocBook DO-178B documents as described above. All you have to do is make sure the tools are installed. Debian, SuSE, and Fedora or Fedora Core Linux fall into this category, to my knowledge. But with some effort, you can install the tools on any Unix-type operating system, even if not included with your distribution. The programs for the conversions are called db2ps or docbook2ps (DocBook-to-Postscript), db2pdf or docbook2pdf (DocBook-to-PDF), db2html or docbook2html (DocBook-to-HTML), and db2rtf or docbook2rtf (DocBook-to-RTF). These are actually scripts, based on the free programs jade (or openjade) and TeX (or LaTeX). Using them is completely straightforward. Using programs like db2pdf, db2rtf, etc., is not the only alternative for performing DocBook conversions under Linux. The method described in the following section (covering Microsoft Windows) using the XMLmind XSL-FO converter program works perfectly well also. jw -f docbook -b pdf "$@"
jw -f docbook -b pdf --dcl /usr/share/sgml/xml.dcl "$@"
Presumably, a similar fix works for db2rtf, or other conversion scripts. I believe that one way to convert DocBook under Windows is to install Cygwin, which is a sort of Linux emulator for Win32, and then to install the DocBook tools under Cygwin, so that you could use the same commands and stylesheet modifications mentioned above. But I've not done it myself. If/when I know more about doing so, I'll post it here. PRO: The XSL-FO converter can create not only the PDF, RTF, and HTML files as the Linux converter can, but can also create native OOXML (for Word 2007) or ODF (for OpenOffice.org). Difference: The XSL-FO converter uses XSL stylesheets rather than DSSSL stylesheets, so the stylesheet modifications I suggest above won't work as given. I have made some changes to the XSL stylesheets that come with the converter, and these changes are available to you if you download the Do178Builder development snapshot. Consult the README file in the snapshot for instructions. (You must use my stylesheet in conjunction with the stylesheets distributed with the XSL-FO converter if you expect to produce something like the sample documents below.) I actually provide two XSL stylesheets. One, Do178Builder.xsl, is designed for compatibility with the DSSSL stylesheets; the compatibility isn't perfect, but the results are somewhat similar. The other, MyCustomization.xsl, is a jumping-off point you can use to customize the stylesheets for your own purpose; it happens to produce a result that's somewhat visually similar to a document template they like us to use at the company for which I work, and includes some flourishes like a logo in the page headers. 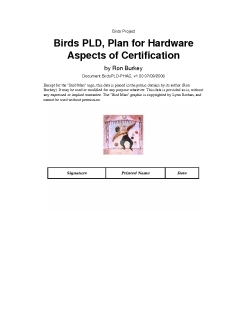 For a visual comparison, below are PHAC documents (the DO-254 Plan for Hardware Aspects of Certification) for the fake "Birds PLD" project described elsewhere on this website. The only differences between the methods of creation for the various PDFs were that different DocBook converter programs were used (db2pdf vs. xslutility), and different stylesheets (DSSSL vs. XSL); in other words, Do178Builder produced a single set of DocBook 4.1.2 XML files, and that same set of DocBook XML files was post-processed for all of the PDFs. in Linux, with DSSSL stylesheets. The XSL-FO converter program itself is quite straightforward to operate, and doesn't really require any instructions. It may be worthwhile to note that some of the stylesheet parameters can be adjusted through the converter program's user interface without having to modify the stylesheets themselves, but it's an obscure enough feature that you may need to hunt around to figure out how to do it. If this shows that gij will be run, you need to perform some kind of trickery to make sure that true Java is used by the XMLmind XSL-FO converter program instead of gij. Various tricks will work, such as moving the directory which contains the 'java' executable to someplace early in the PATH. Perhaps the easiest thing to do is to edit the xslutility file itself, which happens to be a script, so that 'java' has a full pathname. Originally, this section contained a description of the best graphics formats to use, relative to the type of document format (PDF, RTF, etc.) you wished to create. However, for a number of years I have simply been using JPEG graphics across the board, regardless of the output format, so I assume that a discussion of this topic is no longer needed. For Postscript or PDF: Use EPS (Encapsulated PostScript) format. For RTF: The default graphics format is EPS. Unfortunately, if you load the RTF file into Microsoft Word with embedded EPS graphics, the graphics won't be previewed on screen, and will only print on Postscript printers. It's therefore better to use another graphic format (like JPG or PNG). I haven't found out yet how to change the default. 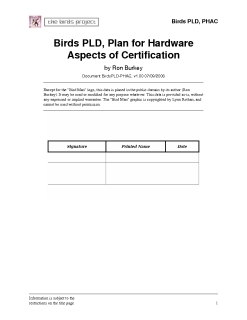 For example, consider including an organization chart into your DO-178B documents. You might provide the graphic in two formats, say OrgChart.GIF and OrgChart.EPS. Within Do178Builder, when you specify the filename of the graphic file, you'd simply use "OrgChart." The file-extension ".GIF" or ".EPS" would be filled in for you automatically during the document conversion. Without changing the default extensions, I know of no really clean way to handle the graphics for an RTF document. The best solution I've found so far is to produce the graphics in a format good for Microsoft Word, such as JPEG, but to simply rename the files as if they were EPS files before converting the documents. For example, create OrgChart.JPG, but rename it to OrgChart.EPS. Hopefully, a much cleaner solution can be found. 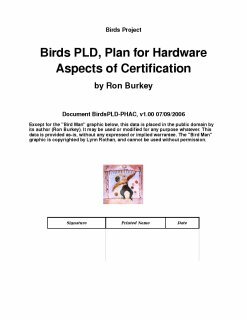 This page was last modified by Ron Burkey on 03/12/2008. 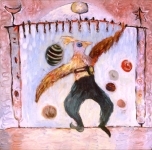 Contact the Birds Project.